At some stage in June, your garden will be a glorious affair full of scent and soft flower. Placing a posy from the garden, close to a family hub like the kitchen table, unites your home and garden as effectively as having a huge picture window. You don’t have to be a serious flower arranger either. All it takes is a simple jug, or small vase of well-chosen plants carefully harvested so that your garden hardly notices. If you have a larger garden, it’s well worth creating a designated cutting garden specially for picking perennials, bulbous plants and annuals in country house style. Your cutting garden could have wicker edges, or obelisks at each corner, or a simple picket fence should you wish. If you have a smaller garden you can still snip away, but never denude your plants because garden flowers last much longer than cut flowers. Cut the flowers in the morning if you can, as early as possible, and immediately immerse each stem in a bucket of cool water up to its neck and then stand them in a shady place and let them drink for a few hours. This will also allow any pollen beetles to escape, a necessity for sweet peas. Soft stems need a diagonal cut with sharp scissors to increase the surface area of stem and help the uptake of water. Woody stems need distressing, with a small hammer or similar. When arranging, don’t allow any foliage to linger below the waterline, it will green up the water as it decomposes killing the flowers. It will also smell. Change the water regularly, or top it up. 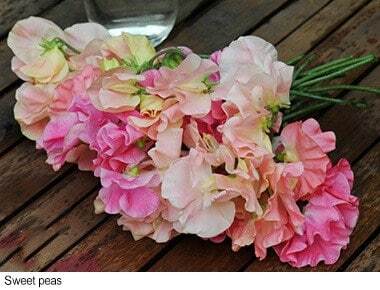 Refresh the flowers by taking them out of the container and discard any spent flowers. Recut the stems of those that will do a little longer. Shake each flower so that it sheds any debris and then rearrange.